Racing History: Len, known as 'Len Orton-Green' back then, started racing in the Renault 5 Elf Turbo UK Cup in its inaugural year and continued in the 1986 season. The series also included overseas events where Len raced at Vallelunga in Italy in 1985 and Jarama, Spain in 1986. In 1987 Len switched to a Peugeot 205 GTi to compete in the Uniroyal and Monroe Production Saloon Car championships and twice raced in the prestigious Willhire 24 hour race at Snetterton in 1987 and 88. For the 1989 season Len swapped his Peugeot for a VW Golf GTi 16v continuing in the Uniroyal & Monroe championships. In 1990 Len only raced at a couple of meetings in the Firestone Production Saloon Car championship before retiring from racing. However, feeling the need for speed again, Len decided to resurrect his racing career and bought a VW Vento VR6 to compete in the new Tomcat/Vento Challenge series in 1997. 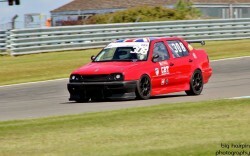 Continuing in the Tomcat/Vento Challenge until its final season in 2000 Len also competed in the newly formed VW Cup series which started in 2000. 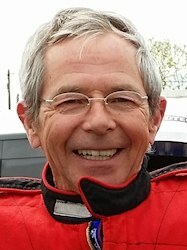 Len continued in the VW Cup for the 2001 and 2002 seasons before retiring from racing for the second time after an unnerving crash in the final race of the season at Thruxton. After repairing the car he sold it. Missing his racing Len bought another VW Vento VR6 in 2007 and spent several months rebuilding it before competing in a couple of races in the Classic Touring Car Pre 93 championship in 2008. 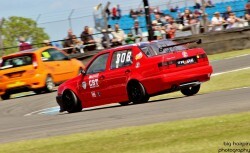 Len continued in the Pre 93 championship in 2009 and also raced in a couple of rounds of the new VAG Trophy series and a one off race in the Thundersaloons at Mallory Park. However, that didn't work out too well after being pushed in to the pit wall at the start of the race sustaining heavy damage to the car. He sat out the 2010 season and returned in 2011 to the Pre 93 championship before switching to the VAG Trophy championship for the 2012 season. Continuing in the VAG Trophy in 2013 the series included an overseas event at the famous Spa Francorchamps circuit in Belgium which Len enjoyed despite a wheel falling off the car resulting in a crash in to the tyre barrier! 2014 saw another year in the VAG Trophy before switching to the new Classic VW Challenge for the 2015 season. The 2016 season was dogged with mechanical issues including a major engine blow up during testing so Len only managed to compete in the final race meeting of the season. After the first meeting of the season of the Classic VW Cup at Rockingham in 2017 Len took the difficult decision to retire (this time for good) at the age of 74 after a racing career spanning 32 years. Unfortunately never managed to achieve an outright race victory although had finished 2nd and 3rd on many occassions and had class wins! Other hobbies: None. Racing is everything!